Austria has glacier ski resorts in spades – great for when you want to ski early or late in the season (or even ski during the summer). But, by their nature, glaciers tend to be a fair way away from the villages and sometimes those looking for a snow-sure ski holiday just want to be able to tumble out of the accommodation and be on skis as quickly as possible. The ski resorts below offer real ski-in ski-out accommodation and are high enough in altitude to ensure that visitors should be able to enjoy a ski break at any time during the winter. If Obergurgl has no snow, then there is unlikely to be much elsewhere in Austria. It is situated at an altitude of nearly 2000m at the end of a long side valley off the main Inn river route and offers enough intermediate level runs to keep most average skiers happy for their week on the snow. Anyone looking for an even higher option could always choose the high-level satellite of Hochgurgl – a short bus- or gondola-ride away from the main settlement. Proper Tyrolean-style hotels rather than modern concrete blocks make the hamlet more attractive for a real ski holiday in the snow. Isn’t this cheating? 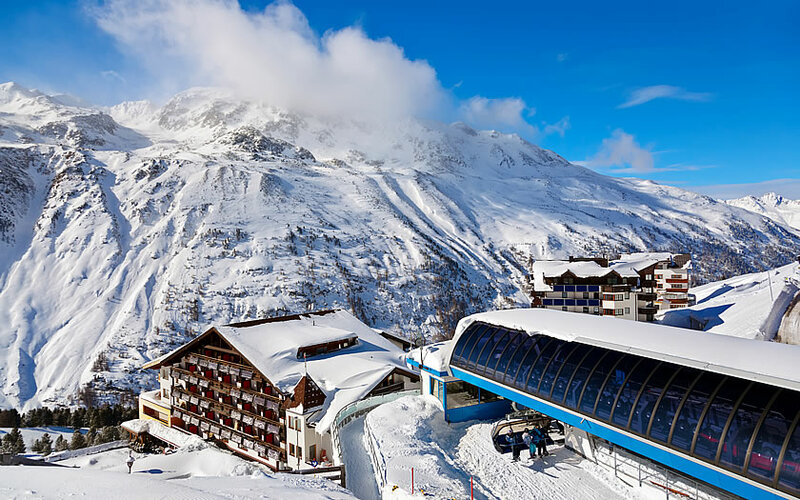 Sölden actually features in our list of Austrian glacier ski resorts. Well, not really. Sölden does have the Rettenbach and Tiefenbach glacier and, unlike many glacier resorts, the skiing there is actually connected into the main runs above the village. But, in its own right, the village of Sölden is at a decent altitude (nearly 1400m) and the main runs above the village go up to well over 3000m. Try the red all the way down from the top of the futuristic Gaislachkogelbahn two-stage gondola and see if your knees are still working at the end of the run. And, like its neighbour Obergurgl above, it also has its own even higher accommodation option in the form of Hochsölden. Kühtai seems to have suddenly sprung onto the British ski holiday market in the last few winters. But for Innsbruck locals it has long been the place to head for if skiers are looking for a day in guaranteed good snow. Kühtai is actually over 2000m and at the top of a high mountain pass between the Sellrain valley and the Ötz valley. It has good, if limited, intermediate skiing and the accommodation in this high ski resort can be surprisingly reasonable in price. Obertauern is another ski resort set on a high mountain pass – but in this case it is over in the Austrian province of Salzburg. It is lower than Kühtai at a still respectable altitude of 1730m but it also provides a lot more skiing and accommodation once you get there. In fact, that’s part of the attraction of Obertauern (and Zauchensee below) – the resorts are relatively easy to get to by car because of the proximity of the motorway heading south from Salzburg. The skiing is also pretty interesting on two sides of a big bowl with a couple of harder runs to test the experts. Zauchensee is at the end of a high mountain valley in the province of Salzburg – but the good news for drivers is that the valley is not that long and the altitude gain is not too much. An altitude of 1350m is still respectable enough, though, and the bowl around the ski village has the feel of a much higher resort. One of the most attractive features of Zauchensee is its skiing in general and its links over to the neighbouring Flachauwinkl ski area. It is one of the reasons that the World Cup ski races make a regular stop here. One of the problems with the resort is the limited amount of accommodation – although those keen to stay in the area can always choose the nearby lower town of Altenmarkt with its own ski area.